We searched electronic databases and included randomized trials with isoflavones interventions in the forms of tablets, isolated soy protein or soy diets. Review Manager 4.2 was used to calculate the pooled risk differences with fixed effects model. Seventeen studies (21 comparisons) with 853 subjects were included in this meta-analysis. Isoflavones tablets had insignificant effects on serum TC, 0.01 mmol/L (95% CI: -0.17 to 0.18, heterogeneity p = 1.0); LDL, 0.00 mmol/L (95% CI: -0.14 to 0.15, heterogeneity p = 0.9); HDL, 0.01 mmol/L (95% CI: -0.05 to 0.06, heterogeneity p = 1.0); and triglyceride, 0.03 mmol/L (95% CI: -0.06 to 0.12, heterogeneity p = 0.9). Isoflavones interventions in the forms of isolated soy protein (ISP), soy diets or soy protein capsule were heterogeneous to combine. Isoflavones tablets, isolated or mixtures with up to 150 mg per day, seemed to have no overall statistical and clinical benefits on serum lipids. Isoflavones interventions in the forms of soy proteins may need further investigations to resolve whether synergistic effects are necessary with other soy components. In recent years, phytoestrogens have attracted a great deal of interests in the medical and scientific literature. It also appears in the lay press for its effects on cardiovascular and menopausal health, and even cancer prevention. These compounds are present in large quantities in soybeans, clover and some legumes. Because of resemblances to human estrogen and the observations that Asian populations who consume more isoflavones compared with women in western countries have less menopausal symptoms, isoflavones are postulated as natural products that may be beneficial to postmenopausal women in cardiovascular health. Commercial products containing different quantities and mixtures of isoflavones are now widely available. A meta-analysis of soy protein in 1995 found significant cholesterols lowering effects when compared with animal proteins . The authors suggest that isoflavones may be the principal physiologically active components responsible for the lipid lowering effects. However, it is still controversial . Many reviews and editorials [2, 3] have discussed the relevance of phytoestrogens on cardiovascular health and hypocholesterolemic effects but there was no meta-analysis up to our searching. We searched the databases from ACP Journal Club 1991 to Oct 2002, Cochrane Controlled Trials Register 3rd Quarter 2002, Cochrane Database of Systematic Reviews 4th Quarter 2002, Database of Abstracts of Reviews of Effectiveness 4th Quarter 2002, British Nursing Index (BNI) 1994 to Oct 2002, CANCERLIT 1975 to Oct 2002, CINAHL 1982 to Oct Week 4 2002, CSA – Life Sciences Collection 1982 to Oct 2002, EMBASE 1980 to 2002 Week 45, International Pharmaceutical Abstracts 1970 to Oct 2002, PREMEDLINE Oct 27, 2002, MEDLINE 1996 to Oct Week 4 2002. We searched the keywords with Ovid software version rel6.2.0: 'soy', 'soy protein', 'soybean', 'tofu', 'phytoestrogen', 'isoflavone', 'genistein', 'daidzein', 'formononectin' and 'biochanin A' by the method described by Dickersin 1994 . We did not restrict any languages during the searching. Hand searching was made by retrieving relevant articles from the obtained studies and unpublished data were obtained through contacting experts. We identified on-going trials by searching ClinicalTrials.gov, the UK National Research Register and Meta-register of controlled trials on the internet. 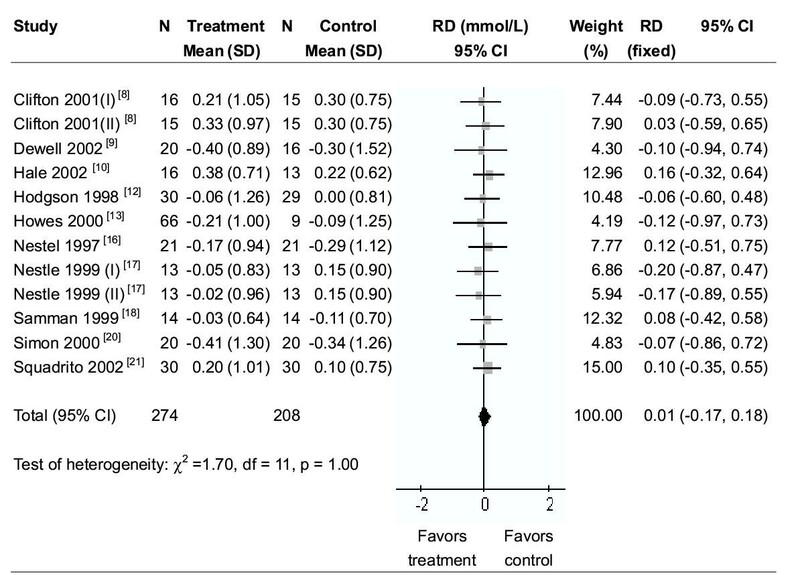 We included both single and double blind randomized controlled trials with baseline and after treatment values for synthesizing risk (mean) differences. The outcome measures were differences of serum total cholesterol (TC), low density lipoprotein cholesterol (LDL-C), high density lipoprotein cholesterol (HDL-C) and triglycerides (TG) between post-randomization baselines and after treatments. Eligible interventions were isoflavones tablets of single isolated component or any mixtures of genisteins, daidzein, formononectin and biochanin A. Isoflavones interventions in forms of soy protein supplements or diets were also included as long as they compared isoflavones containing treatments with isoflavones depleting controls. Treatments with soy polysaccharides, fiber, and phytosterols as their primary interventions were excluded. Two independent investigators reviewed the articles obtained without masking. There were no scorings to the included trials. Data were entered twice to reduce input errors. Inter-rater reliability was not performed. Data were abstracted with a designed form before analysis. Duplicated trials or studies with the same population were counted once to reduce the duplicated publication bias. Data disagreement between the two reviewers was resolved by discussion. The characteristics of the obtained studies were tabulated with subtypes of isoflavones interventions, subjects' serum lipids status, dosages of isoflavones and lengths of treatment. Sub-group analysis was performed with different forms of isoflavones interventions, such as isolated genistein or mixtures of isoflavones tablets versus placebo, isoflavones containing versus depleting soy protein diets. Sensitivity analysis was also made across different population characteristics and lengths of treatment. Funnel plots were used to detect possible publication bias or treatment heterogeneity across sample sizes. where n1 and SD1 were sample size and standard deviation from treatment and n2 and SD2 were from control. Inverse variance method was used to pool all trial results  with software 'Review Manager 4.2 . Fixed-effects model was used as the method of combination and it was supplemented with random-effects model if necessary. Since log odds ratios were not available in the trials, funnel plots were plotted with standard errors against risk (mean) differences. The trial flow chart was illustrated in Figure 1. Seventeen studies [7–23] (21 comparisons) with 853 subjects were included in this meta-analysis. Reasons for exclusion were non-randomization, lack of control [24–27], insufficient original data and baseline values [28, 29]. Trial flow chart of including isoflavones studies. Databases generated 3542 potential eligible randomized controlled trials (RCT). 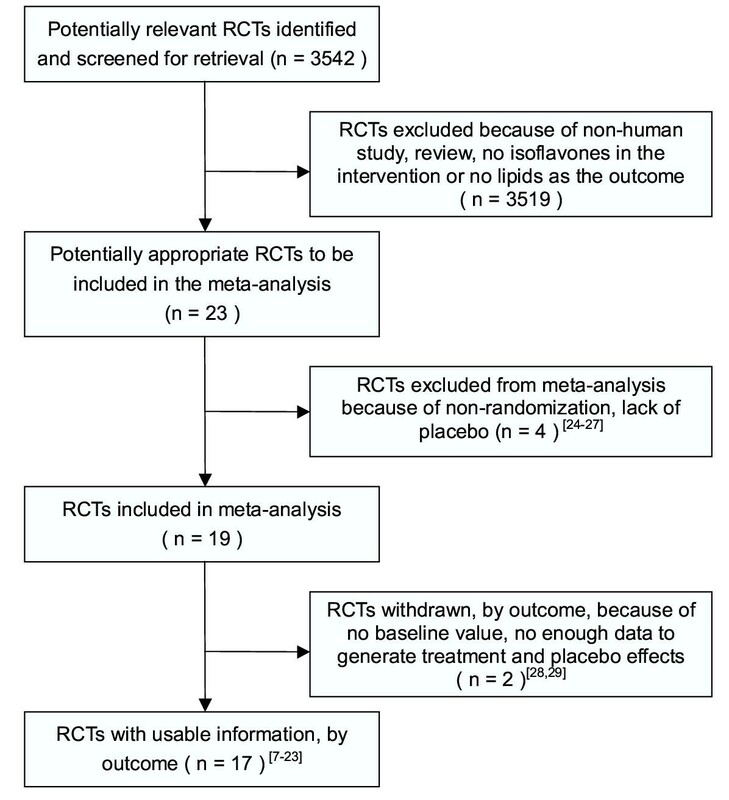 After careful review, seventeen RCT (reference [7–23]) were included in this meta-analysis. The characteristics of the trials included were shown in Table 1. The populations being studied were adults of age between 18 and 73. Soy phytoestrogens interventions varied from isoflavones tablets to isoflavones containing soy diets. Isoflavones tablets were introduced in 11 trials, soy capsule in 1 trial, isolated soy protein (ISP) in 3 trials, and soy foods in 2 trials. The average intake of isoflavones was 73 mg per day (ranging from 28.5 to 150 mg) and length of treatment was 10 weeks (ranging from 2 to 26 weeks). Three trials recruited hyperlipidemic subjects while 8 included participants with normolipidemia. Thirteen studies recruited female, two recruited male and two recruited subjects with both genders. Characteristics of the 17 included studies. There were 9 crossover and 8 parallel studies. The isoflavones tablets introduced were mainly in aglycone form. The abbreviations were listed below table. We found that isoflavones tablets insignificantly increased serum TC by 0.01 mmol/L (95% CI = -0.17 to 0.18; heterogeneity p = 1.0) (Figure 2); LDL by 0.00 mmol/L (95% CI = -0.14 to 0.15; heterogeneity p = 0.9); HDL by 0.01 mmol/L (95% CI = -0.05 to 0.06; heterogeneity p = 1.0); and triglyceride by 0.03 mmol/L (95% CI = -0.06 to 0.12; heterogeneity p = 0.9). Isoflavones containing soy biscuits or burger had insignificant effects on serum TC with reference to isoflavones depleting soy biscuits or burger. Only isoflavones containing isolated soy protein (ISP) or soy protein (SP) capsule reduced serum TC when compared with isoflavones depleting ISP or SP capsule (Table 2). There was only one trial  introduced SP capsule as treatment. Mixtures of the four soy phytoestrogens (genistein, daidzein, formononectin and biochanin A) or isolated genistein did not have significant effects on serum TC. The significant result from intervening the mixtures of genistein and daidzein had shown to be statistically heterogeneous to combine (heterogeneity p = 0.06) as genistein and daidzein tablets were introduced among 3 studies [9, 10, 16] while Sanders  chose genistein and daidzein soy burger and Urban  used genistein and daidzein ISP. In subgroup analysis, the effect of genistein and daidzein tablets on serum TC from the 3 studies was shown to be insignificant, 0.1 mmol/L (95% CI = -0.25 to 0.45; heterogeneity p = 0.87). Dose-response effect was not found in any forms of interventions in this meta-analysis. The results remained insignificant when the length of treatment increased. Although one trial  (without washout period) produced significant effect, it seemed that study design had no influence on the serum TC. There were insignificant decreases of serum TC among pre- and postmenopausal women. Interestingly, cholesterol lowering effects could only be found among normolipidemic subjects but not participants with hyperlipidemia and men were shown to be benefited with isoflavones treatment. Isoflavones in the forms of tablets and ISP were all insignificant on serum low density lipoprotein cholesterol (LDL), high density lipoprotein cholesterol (HDL) and triglycerides (TG). These results were shown in Table 3. Funnel plots of isoflavones tablets were asymmetrical and the results of the published trials tended to favor treatment. Subgroup analysis of the effects of isoflavones on serum total cholesterol. Isoflavones were shown to have significant benefits when given in the form of ISP or soy protein capsule. Regardless the forms of prescription, isoflavones decreased serum total cholesterol among normolipidemic but not hyperlipidemic subjects. Effects of isoflavones on serum LDL-cholesterol, HDL-cholesterol and triglycerides levels. Isoflavones in the forms of tablets or isolated soy protein (ISP) did not show significant benefits over serum LDL-cholesterol, HDL-cholesterol and triglycerides levels. The results were not heterogeneous to combine. Phytoestrogens with either isolated genistein or isoflavones mixtures of genistein, daidzein, formononectin and biochanin A were found to be statistically insignificant in lowering serum total cholesterol (Table 2). Resolving the heterogeneity from pooling the mixtures of genistein and daidzein, we found that tablets prescription with these two isoflavones [9, 10, 16] yielded insignificant benefits over serum TC, 0.1 mmol/L (95% CI = -0.25 to 0.45; heterogeneity p-value = 0.87). One trial , introducing soy burger as the prescription of these 2 isoflavones, found insignificant benefits. Another trial , prescribing them in the form of isolated soy protein (ISP), had shown a decrease in serum TC by 0.43 mmol/L (95% CI = -0.73 to -0.13). It may be a result of bias as this trial lacked a washout period. When dose-response effect and treatment length were taken into account, phytoestrogens seemed to have insignificant effects over serum cholesterol (Table 2). Isoflavones in the forms of tablets, soy burger or biscuits seemed to have insignificant benefits over serum TC. Only Han  reported a significant benefit for isoflavones in the form of soy protein capsule. Isoflavones in the forms of tablets or ISP could not be shown to have significant benefits over serum low density lipoprotein (LDL) cholesterol, high density lipoprotein (HDL) cholesterol and triglycerides (TG) (Table 3). We could not demonstrate significant benefits with all types of prescriptions when the dosages or treatment lengths increased. No dose-response effect was detected nor benefits on serum cholesterol with any forms of prescription among pre- and post-menopausal women and hyperlipidemic subjects. The benefit over normolipidemic subjects was heterogeneous (p = 0.08). It may be again the result of prescription diversity. Separated analysis found that isoflavones tablets [12, 18, 21] had insignificant effect on serum TC among normolipidemic subjects, 0.05 mmol/L (95% CI = -0.23 to 0.33; heterogeneity p = 0.9). Only isoflavones in the form of soy protein capsule  or ISP  reported benefits on participants with normolidemia. In fact, some suggest that the beneficial effects of soy protein require synergistic reactions between isoflavones and other soy components . This hypothesis was supported by some animal experiments [33–35]. It seemed that isoflavones in the form of tablets, up to 150 mg per day (genistein about 50 mg, daidzein about 50 mg), had no significant benefits on serum cholesterols in this meta-analysis. Phytoestrogens treatments in forms of soy protein supplements or soy protein capsule may need further investigations, especially interactions between other chemically active components inside prescriptions. In subgroup analysis, the sample sizes were inevitably reduced and there might be insufficient power to detect small significant differences. Isoflavones treatments with dosages beyond 150 mg per day or treatment lengths beyond 26 weeks could not be shown in this study. The effects on serum cholesterols among subjects with hypertension, diabetes mellitus or other cardiovascular risk factors were also beyond this meta-analysis. Generalizability over other phytoestrogens such as coumestans, lignans and resveratrol may need further trials to clarify the questions. No funnel plots were shown in this study because the choice of risk differences as the horizontal axes may lead to funnel plot asymmetry . Publication bias was still possible although vigorous searching had been attempted. It was suggested that isoflavones readily bind estrogen receptors – beta (ER-beta) which are an important receptors in both the central nervous and cardiovascular systems [37–39]. Isoflavones may also have anti-oxidant effects on blood vessels [40–42]. However, compared with estradiol, isoflavones bind estrogen receptors with 100 and 1,000 times less affinity . Both conjugated and aglycone forms of daidzein and genistein are rapidly cleared from the plasma following a single dose of isoflavones  and urinary excretion is virtually nil within 48 hours after ingestion [44, 45]. Biological effects of soy phytoestrogens are still controversial. The hypothesis from an influential meta-analysis  stating soy estrogens may be responsible for the lipid reduction effects was criticized for the fact that the trials involved largely isoflavone-free soy protein products . Apart from phytoestrogens, in fact, some other components such as phytic acid, saponins and fibers were potential candidates responsible for the hypocholesterolemic effects [32,48,49]. Tablets of single isolated isoflavone with considerable dosages may be important in future randomized trials. Intervention with isoflavones mixtures may be helpful but interactions between components should be handled with extra cares. Introduction of phytoestrogens in forms of soy diets is not suggested because we found much heterogeneity inside the diets, ranging from soy biscuits to burger, which may be difficult to combine and analyze. Confounding factors such as fiber, fatty acids, amino acids and energy intake are especially hard to control. Complications associated with hyperlipidemia, such as coronary heart disease (CHD) or cardiovascular accident (CVA), may be selected as other endpoints in future trials. It may help constructing convincing funnel plots with less heterogeneity as trials accumulate. Isoflavones tablets, up to 150 mg per day, had insignificant effects in lowering serum total cholesterol, LDL-cholesterol and triglyceride. There was also insignificant benefit over serum HDL-cholesterol. The results were consistent when tablets were introduced as isolated genistein, mixture of genistein and daidzein, or mixture of genistein, daidzein, formononectin and biochanin A. No significant effects were found among participants with normo- or hyperlipidemia and women with pre- or postmenopausal status. Isoflavones interventions in the forms of soy proteins, such as isolated soy protein (ISP), soy diets or soy protein capsule, were inconclusive due to inadequate sample size, heterogeneity and presence of potentially uncontrolled confounders. JY participated in the design of this manuscript. JY and YTF participated in abstracted the data and performed statistical analysis. All authors read and approved the final manuscript.